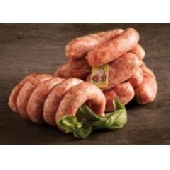 01/12/2018 - After a hundred years long history the Lovison's products still haven't lost their craftsmanship and traditional tastes, they continue to be an important testament of a simple but rich in flavors and colors cuisine. 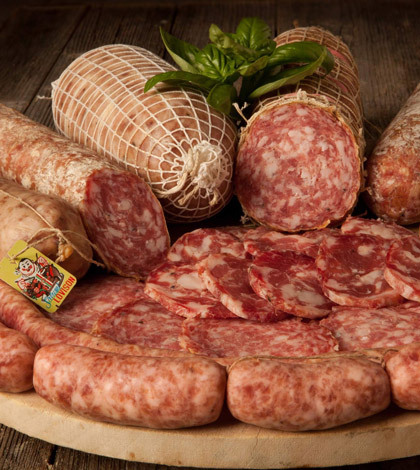 The Musetto, apparently a cotechino (gelatinous pork sausage in a natural casing) but actually a cold cut, is the result of a careful selection of meat coming from cheeks, throat fat and pork rind. 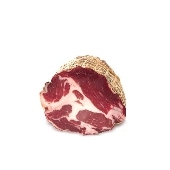 This product was born in 1903 in Spilimbergo. 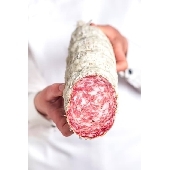 Apart from the Musetto, the Salumificio Lovison produces also many other cold cuts, like the sausage, the salami also in the knife-tip made version and the soppressa. The great Chef Carlo Cracco has transformed the musetto Lovison in a stuffing for his restaurant ravioli. Ravioli stuffed with musetto Lovison with vegetables mustard. Ingredienti for the pasta: 1kg of 00 type flour 8 egg yolks 1 full egg 20g of extra virgin olive oil For the stuffing: 200g of Musette lovison 80g of Savoy cabbage mash tun Make the 200g of stew Savoy cabbage browning with 50g of onion, then pour them with water and salt and cook them for 1 hour at least. Blend them in the mixer adding the musetto Lovison, season with salt and black pepper. For the mustard (80g) 80g of celery julienne cut With the flour, eggs, oil and salt make an italian fresh pasta. Pat the dough, put in some stuffing and give it the "cappelletto" shape. Cook the ravioli for 3 minutes in boiling salted water. 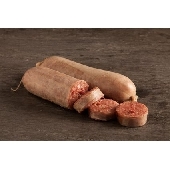 Put them on a soup plate together with the vegetable mustard and the celery. 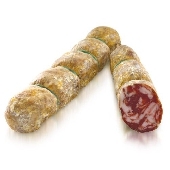 Salame punta di Coltello - 750 gr. 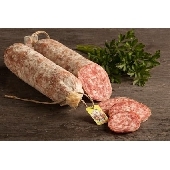 1 Salsiccia ( salamina ) - 100/150 gr. c.a.